Street Food is an excellent way to gauge local flavors and preferences, primarily because the abundance of some and paucity of other ingredients leads vendors to experiment and come up with dishes that most locals will like. 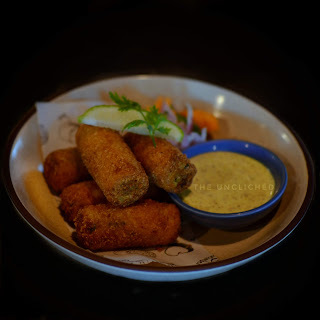 Kolkata is a place where food has had significant influences from Mughal and British cuisines, having been at the center of many a revolution. 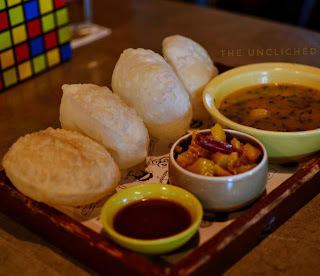 A street food festival celebrating Kolkata Street Food at an upscale pub in Bangalore seemed an unlikely place to get a taste of such a rich cultural diversity, and I was pleasantly surprised by the wonderful rendition of some classics at the ‘Next Stop Kolkata’ street food festival at Monkey Bar. Located in the hotbed of the Namma ‘Ooru dining and pub scene, Monkey Bar at Indira Nagar is not hard to find. The entrance is flanked by a Yellow Ambassador Taxi Cutout, a throwback to a time when Uber and Ola were not even in existence, and travelling in these ‘Peela’ Calcutta Taxis was almost considered a luxury for the masses. As we settle down at our seat on the first floor of this neat space, early on a Saturday afternoon, tiny touches such as labelling of sections of the pub to various food stops of Kolkata, as the smell of freshly fried hing-er kochuri and ghooghni comes wafting from a nearby table, a wee bit of nostalgia does creep in. They have a few cocktails crafted specially for this festival and here are the ones we really liked. 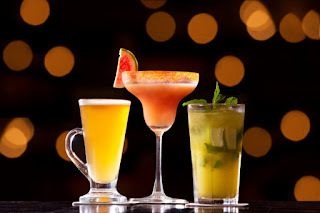 Puchka Paani Capriojka: Vodka, ‘Gondhoraj lebu’(a particularly flavourful lemon variant found in abundance in West Bengal), mint leaves and a delicious, tangy, slightly spicy & sweet, puchka paani make up this super-refreshing cocktail. Superbly balanced and fairly potent, this is my favorite from the lot. Thaanda Cha: Revolutions, political or otherwise have been known to have been incepted over a cup of lal cha(red tea or tea without milk) in a Calcutta. This cocktail is a tribute to local tea shops in Kolkata. Darjeeling Tea, vodka and a few spices like cinnamon & star anise make up this lovely cocktail. People who have had cha in Kolkata will especially appreciate this cocktail. 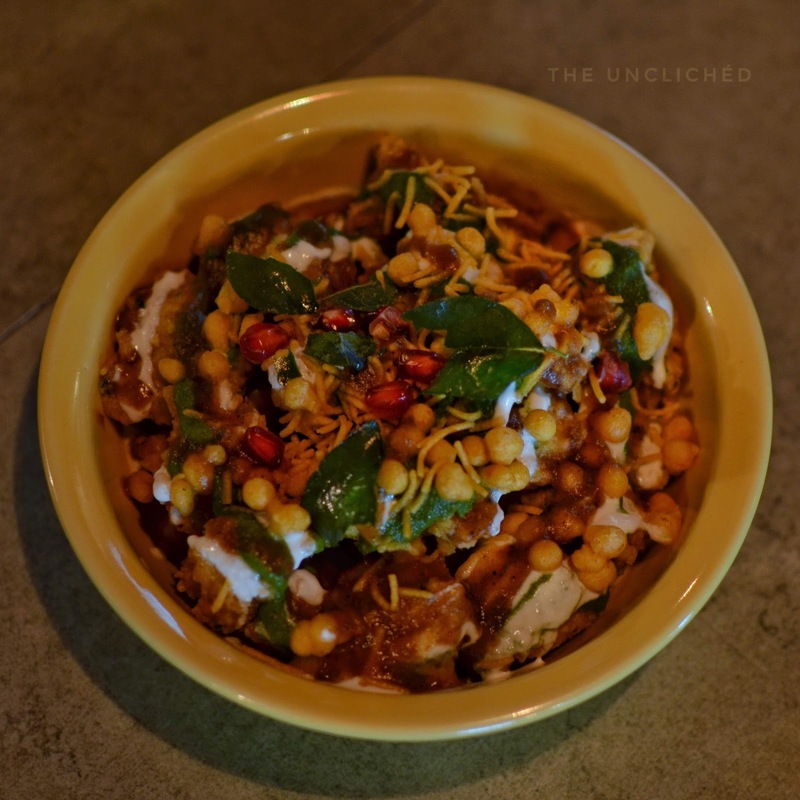 Vardaan Market Moong Dal Pakodi Chaat: This dish is reminiscent of the chaat that is served on the streets of Kolkata as ‘North Indian’ chaat. 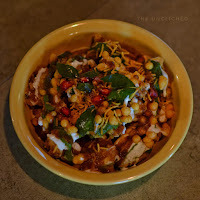 Crisp, deep-fried Moong Dal wadis, topped with a sweet-spicy mint and tamarind chutney, yogurt and fried curry leaves. This dish will be loved equally by vegetarians and non-vegetarians alike! I am told that they so designed this dish that it stays crispy for a longer duration, so that you can have it as a bar-snack, and I believe them! 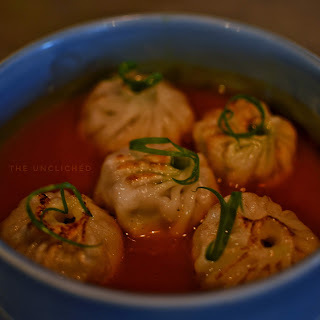 Elgin Road Pork Momos: Momos as a street food in Kolkata have been around way before ‘dimsums’ became a fad, and piping hot steamed momos can be found at most street corners here. The version here is served in a tangy, spicy smoked tomato chutney. The well-stuffed dumplings were particularly well made and dipping them in that tangy chutney made them extra succulent! Beadon Street Fish Roll: You know that it is truly Bengali food, when the bhetki(Sea Bass) is used in a fish roll. No, this is not a roti/parantha encased roll, but these are crumb-fried ones, a smoked bhetki fillet stuffed with a curried-prawn mix. Crispy on the outside, juicy and oozing with flavors on the inside, this is probably the best bar snack to have with any cocktail or even chilled beer. I also liked the lovely kasundi spiked salad that was served on the side of this dish. Girish Park-er Shoitan Deem: Devilled Egg, Kolkata style. Boiled eggs are cut in half, encased in a shammi kebab mince mixture and deep fried. This is as good as a scotch egg can ever be! 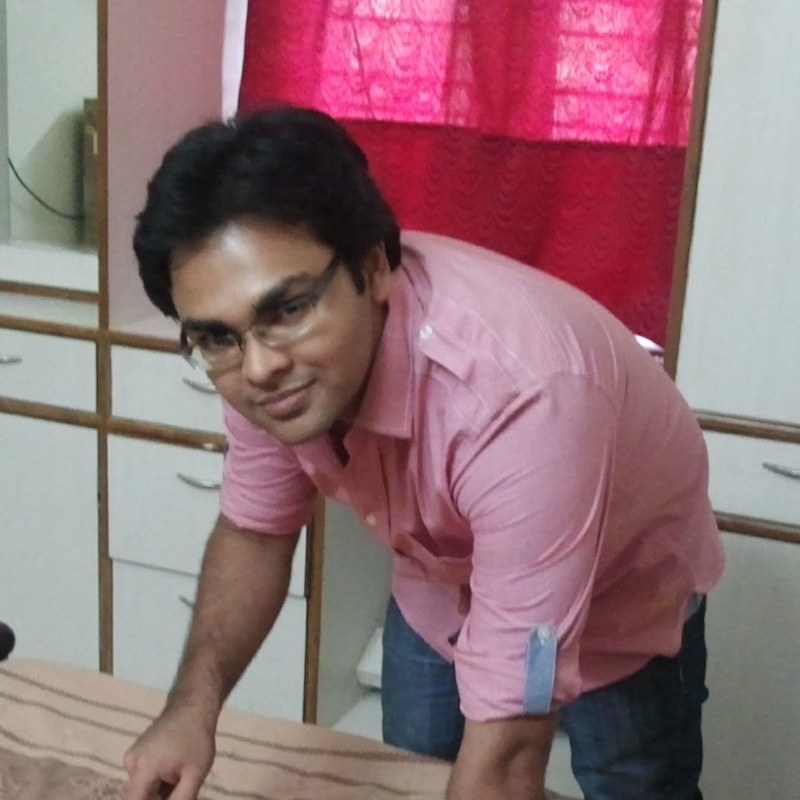 For my vegetarian friends, the Hing-er Kachuri and Vivekananda Park Ghoogni are highly recommended as well. Their Lake Market Kabiraji is also excellent, and I have not had that crispy a kabiraji ever, and believe it or not, it wasn’t too oily! We ended our meal with this beautiful Old Monk & Nutella Cake, which is a part of their regular menu. Verdict: Monkey Bar has always been on my list of pubs which serve really good food, the ‘Next Stop Kolkata’ festival is a must visit for people who want to experience the goodness of Kolkata’s street food. While most of the dishes are adapted versions of classics, I love the fact that they have managed to retain the innate beauty of flavours of the originals. Highly Recommended! P.S. 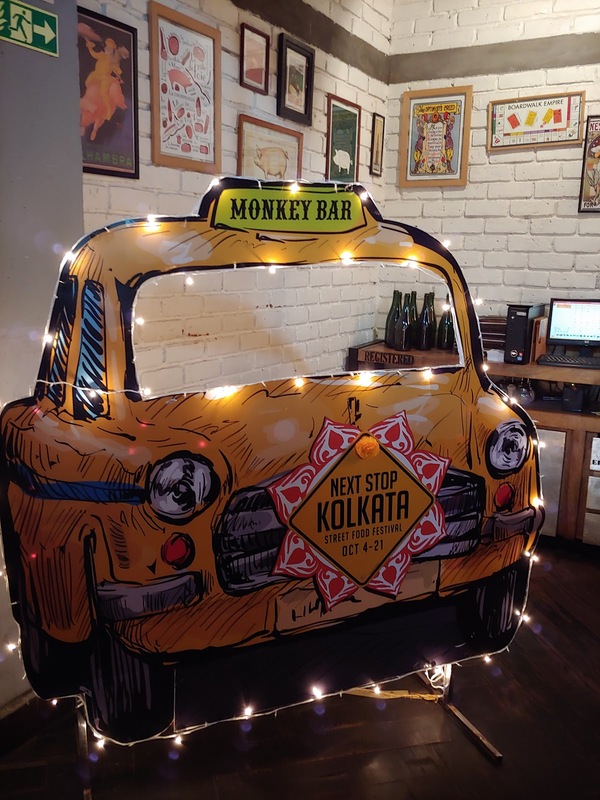 : The ‘Next Stop Kolkata’ Street Food Festival is on till the 21st Of October in all branches of the Monkey Bar across India.